I was reminded today that it is ten years ago to the day that we came so, so close to reaching a major cup final at Wembley, only to cruelly lose against Tottenham Hotspur in extra time. In some ways, it’s a game possibly best forgotten, but it really has to be a game always remembered, particularly given what happened during the remainder of that 2008/09 season. Below, I’ve reproduced my match report from ten years ago when I was devastated but proud in equal measures. The simple truth is that Burnley are out of the Carling Cup having been knocked out by a 6-4 aggregate against Tottenham in the two legged semi-final, but that hardly begins to tell the story of a gut wrenching night full of pride and passion. I dared to headline my report ‘Mixed Emotions‘ after the first leg at White Hart Lane, but that was nothing compared to last night when we had Wembley snatched, and so undeservedly snatched, from our grasp with the clock virtually run down. With away goals counting double, one goal against took us from a winning position to a losing position and momentarily silenced three sides of Turf Moor like I can never remember before. Not for long though as the home fans again rose to our fantastic team and gave them an amazing send off as an embarrassed looking Spurs left ready to prepare for the final. Owen Coyle had said we needed to climb Everest having lost the first leg 4-1, but we did climb it in a sensational performance that saw the Premier League side cut down and when Mark Halsey blew his final whistle with the score 3-0 it meant another bout of extra time. We’d reached the 118th minute when disaster struck with a goal from Roman Pavlyuchenko at the cricket field end. By then I was dreaming of a day out at Wembley and I’m still finding it hard to take that the dream was so cruelly taken away. But let no one take away what in truth was the most fantastic of nights for Burnley Football Club in every other way and I can’t think for one minute that any home supporter left the ground with anything but delight and pride at the way we played even through that incredible disappointment. It was a real Burnley night. For Arsenal we had the snow, this time after a bitterly cold day we were suddenly hit by heavy rain. It really wouldn’t be Burnley would it if the weather was decent? Sky had been building up the game during the day with interviews from Stephen Jordan, Owen Coyle and Paul Fletcher, but they weren’t giving us any sort of chance of turning round a three goal deficit. Neither was I to be honest. I said during the day that I was going to wipe out the first leg, treat it as a different game and hope to turn in a good performance and hopefully a win. Had we done that and won, say 1-0, I would have been more than happy with that. I got that all wrong, but I did get the team right. It was the same eleven as had started at White Hart Lane and the bench picked itself from the remaining players. Our captain Steven Caldwell, missing again through suspension, took his seat in the claptrappers’ box with Jeff Stelling. Unbelievable Skip. Spurs had a strong side out although there was no place for Sandra Redknapp, despite her abilities as a striker (Harry had been critical of his strikers in the two previous games and said they missed chances his wife could have scored). There again there was no place either for Darren Bent. Playing towards the cricket field end we nearly got an early lead with a bizarre own goal and it was one that certainly caught out Premier League referee Halsey. Defender Benoit Assou-Ekotto got a ball back to goalkeeper Ben Alnwick horribly wrong and the former Sunderland stopper did well to keep it out. But Halsey should surely have blown for a free kick for handling the back pass, and what action should he have taken against the goalkeeper therefore for illegally preventing a goal scoring opportunity? For a while it was evenly balanced in horrendous conditions but the Clarets always looked the more likely and just over ten minutes from half time we got the goal we so needed. A foul on Martin Paterson by Jonathan Woodgate some 30 yards out and to the right of goal gave us a free kick. Wise words to my right suggested Robbie Blake might just try to curl one round the outside of a two man wall just as he’d done against Gillingham in 2003/04. It seemed a ridiculous notion to me, he was too far out and too wide, but how on earth could I doubt Robbie’s ability from a free kick? He did just that as Alnwick moved towards his right and he gave him no chance as he curled it home. That really put us in the ascendancy for the rest of the half but there was some bad news when Stephen Jordan was forced off with an injury. Jordan has been in such good form recently and this was a blow although thankfully Christian Kalvenes was able to come on in a straight swap. Half time saw the return of Ralph Coates on the Turf Moor pitch, and I reckon he must have been impressed with what he’d seen of his first club so far in this tie. He’d seen nothing yet. I thought Spurs had their best spell of the night just after the break. They did get forward and they did have a couple of half chances. The overpriced Gareth Bale (he was struggling to get into the team at this time) missed a good chance whilst Luka Modric and Pavlyuchenko both had opportunities. But it was by no means one way and with the most amazing Turf Moor crowd behind us we came storming back into the game and started to put them under some pressure. Yet it was a Spurs attack that led to the second goal. Pavlyuchenko got down the left and crossed but Kalvenes was first there to get the ball away to Wade Elliott deep in his own half. Wade carried the ball forward, looked right and left and eventually played the ball out to Robbie on the left hand side. Robbie moved to the edge of the box and then simply tormented both Chris Gunter and David Bentley. He turned inside them, then outside, back in before eventually beating them on the outside and crossing low across the six yard box. It was just asking for McCann to hit it home and he did just that. It was simply brilliant stuff from Robbie who’d now scored one and created one. I can’t quite remember when the Turf was last like this but the noise coming from the stands now was incredible. People were on their feet everywhere as we went in search of a third goal that would turn the tie on its head. With nine minutes to go Coyle made a switch. He took off Joey Gudjonsson, who had given us a simply superb performance, but he wanted to get an extra forward on and it was Jay Rodriguez. Now Jay scored the winner in an earlier round against Fulham and only a week earlier scored the winner in the FA Cup against QPR, both times after coming on as a substitute. Maybe he could do it again, you could almost believe it. Less than three minutes to go and Pavlyuchenko fouled Wade out on the left touchline. Robbie hit the free kick into the box, Alnwick failed to deal with it and Jay hit a quick left foot volley in. We’d done it, we’d climbed Everest. We’d turned a three goal deficit round. And when the final whistle blew Spurs were thankful for it going into an extra half hour. Another few minutes and I really think we might have seen them off. The first half of extra time was without major incident. In the second half Spurs were just getting a bit too much of the ball for my liking but they weren’t really threatening. There was no doubt that our lads were tiring but they were sticking to their tasks manfully and looked comfortable. “We’re less than five minutes away from a major cup final,” I heard from a fan close by and I really thought we were going to make it. Then with just over two minutes of extra time to go came the goal from Pavlyuchenko. He got on to a low cross from the left and although Brian Jensen got a hand to his low shot he couldn’t prevent it from going in. It was like being stabbed with a sharp knife. I slumped quietly into my seat unable to take it in. We really didn’t deserve it and there’s no way it can be explained. We’d cruelly had it all snatched from our grasp. Spurs added another through Defoe but we can forget that one, we’d gone and it mattered not. By the time the final whistle blew our fans were back on their feet giving the players the sort of reception they deserved. Those players, like us, looked stunned and gutted. We’d given everything we had and it would be wrong to say it wasn’t good enough. It was more than good enough and looking back at the two games you really have to wonder how the hell we’ve gone out. But we have and we have to pick ourselves up and get on with the FA Cup campaign and the Championship. We’d heroes all over the pitch last night and there were many players whose performances warranted winning the man of the match. Under normal circumstances I might well have gone for Joey. Unfortunately there can only be one and it just has to be the little magician Robbie Blake. What a performance he gave us. Do you remember that 2-0 win at Bury back in August? At the time it helped us get over the opening day defeat at Sheffield Wednesday and seemed to be nothing more. We never thought it would lead to this, a cup run that we’ll all remember for the rest of our lives. We’ve got to remember it. We’ve got to remember all the wonderful highs. Jay’s goal against Fulham, Ade’s against Chelsea and then the remarkable penalty shoot out and the heroics of Brian Jensen. The goals from Kevin McDonald and the unbelievable goalkeeping of the Beast against Arsenal. It will help us get over last night and get us ready for more games to come. Embed from Getty ImagesHow do you describe it all? I know how I feel. I’m devastated, absolutely devastated today, but I’m also unbelievably proud of what we’ve achieved. It’s been a brilliant run – thanks Burnley. 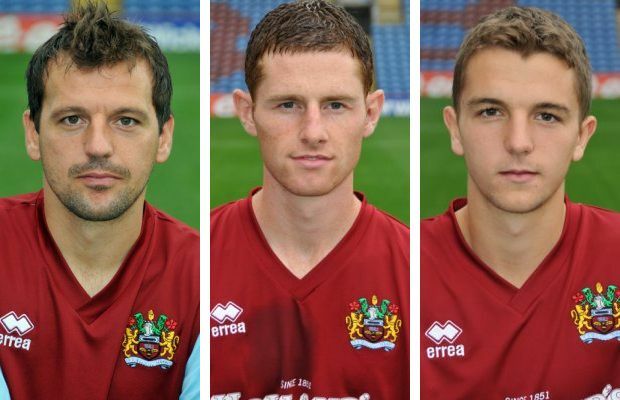 Burnley: Brian Jensen, Graham Alexander, Clarke Carlisle, Michael Duff, Stephen Jordan (Christian Kalvenes 39), Joey Gudjonsson (Jay Rodriguez 81), Chris Eagles, Wade Elliott, Chris McCann, Robbie Blake, Martin Paterson (Ade Akinbiyi 100). Subs not used: Diego Penny, Alan Mahon, Kevin McDonald, Alex MacDonald. Yellow Cards: Chris McCann, Michael Duff. Tottenham: Ben Alnwick, Chris Gunter (Ade Taarabt 95), Michael Dawson, Jonathan Woodgate, Benoit Assou-Ekotto, David Bentley, Didier Zokora, Luka Modric (Roman Pavlyuchenko 65), Tom Huddlestone, Jamie O’Hara (Gareth Bale 62), Jermain Defoe. Subs not used: Cesar Sanchez, Ricardo Rocha, Giovani Dos Santos, Fraizer Campbell.